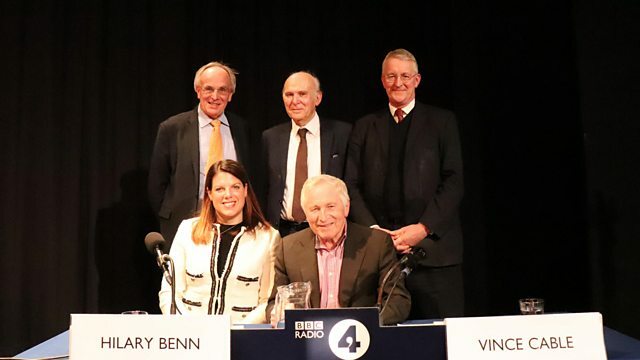 Jonathan Dimbleby presents political debate from Bishop Luffa School in Chichester Sussex with Hilary Benn MP, Peter Bone MP, Sir Vince Cable MP and Caroline Nokes MP. Jonathan Dimbleby presents political debate from Bishop Luffa School in Chichester Sussex with a panel including the Chair of the Brexit Select Committee Hilary Benn MP, Conservative MP Peter Bone, the leader of the Liberal Democrats Sir Vince Cable MP and the Immigration Minister Caroline Nokes MP. Up for discussion today - Brexit.